Next you need to add the shelves. This unit has seven shelves—three in the middle, and two each at the top and bottom. The spaces between the upper two shelves and the lower two shelves are covered by trim. The three upper shelf openings are 17 inches high, and the bottom shelf opening measures 17-1/4 inches. Of course, if you want to display shorter items on the shelves, you can increase the number of shelves (and decrease the space between them). Make sure that you space them evenly, adding any "remainder space" to the lowest opening. Measure and cut seven triangular shelf pieces (E) from 1x10 pine. Each shelf (E) should measure 8-1/8 inches long on the two sides to match the width of your cupboard backs (A and B). (See Figure 3.) As a precautionary measure, check to make sure that both of your cupboard backs (A and B) conform to this width. using both glue and screws. Use six to eight 1-1/4-inch-long screws in each shelf. To prevent the screws from showing in the front, drive them through the cupboard backs (A and B) into the edges of the shelves (C). 4. 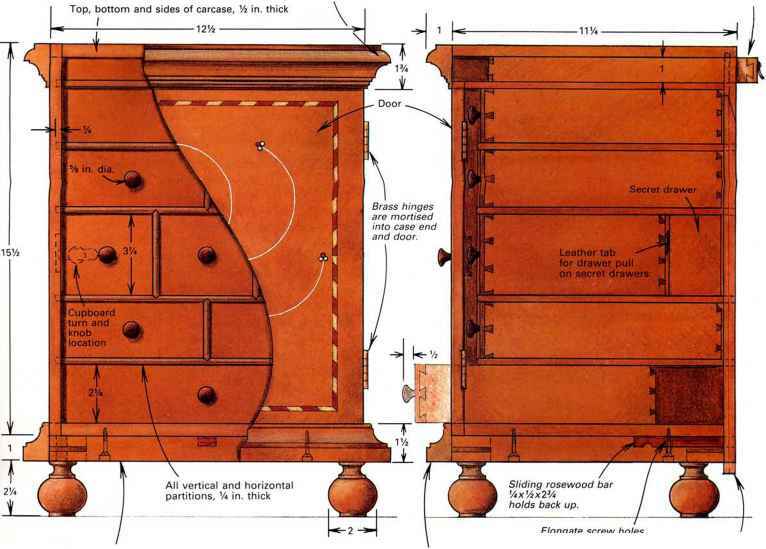 Turn the trim pieces (C) so that the marked corner and the narrow edge of the trim (C) are in the positions shown in Figure 5. Reattach them to the cupboard backs (A and B) using glue and 6-penny finishing nails along the entire length. Space the nails approximately 6 inches apart.